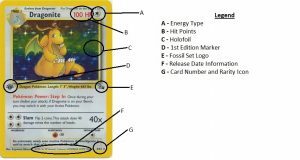 Generation 1 Fossil Set - Pokemon Card Checklist	Overall rating:	4	out of 5 based on 1	reviews. 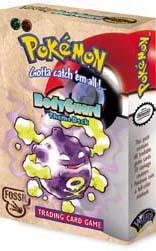 The Pokemon Generation 1 Fossil set was the 3rd North American release from Wizards of the Coast and it completed the original 150 Pokemon roster. It was released in North America in October of 1999, 3 months ahead of schedule. Like the Jungle set before it, this release had both Holofoil and non-holofoil versions of the rare cards, bringing the total number to 62 cards. Like previous releases, the 1st Edition print run sold out quickly and was followed by the Unlimited version. 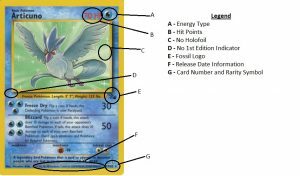 The North American release not only included more cards (62 vs Japan’s 48), but it also removed Mew from the set, saving it for a later promotional release. 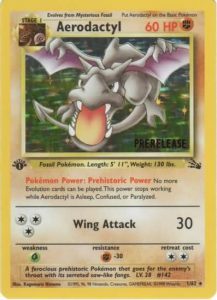 Like the Jungle release, Fossil was meant to be used in conjunction with earlier releases and thus did not offer any Energy cards in its packs. 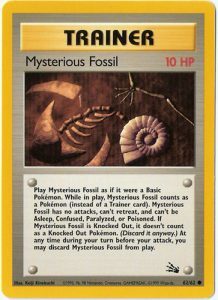 However it did offer a solid selection of Trainer cards, including the Mysterious Fossil Trainer required to use fossil type Pokemon such as Kabuto and Omanyte. 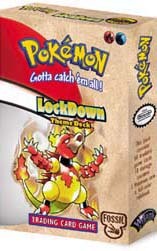 As was the case in previous Pokemon releases, Fossil was also available in Theme Deck builder boxes, which combined with previous releases, to build decks that could be used to play the trading card game. As always each of these boxes contained a rule book, damage counters, and a themed coin, in addition to the cards.